The Battle of Oituz in August 1917 was a tactical victory for the Romanian army, and together with the battles of Mărăști and Mărășești, it saved Moldavia from being taken over by the Central Powers. The German attacks through the valleys of Caşin, Oituz and Slănic into ​​Moldavia had the role of breaking through the Romanian defences in that area for a subsequent junction with the German armies that were on the offensive at Mărășești. In order to make the junction with Mackensen’s troops coming from Focșani, the troops that were to enter Oituz- the Gerok Group – had to reach Grozeşti in the initial phase, followed by a breach of the front, from Cone to Onești, spearheaded by the Austro-Hungarian Benigni Corps. The Gerok group consisted of the German 117th Infantry Division (including the Württemberg Mountain Battalion) and the Austrian VIII Corps, commanded by General Siegmund Ritter von Benigni, who had under its command the Hungarian 70th Infantry Division and the Austrian 71st Division. They were opposed by the Romanian 7th Infantry Division and the Romanian 6th Division (the latter wasn’t at full strength) from the Romanian Second Army, commanded by General Alexandru Averescu. 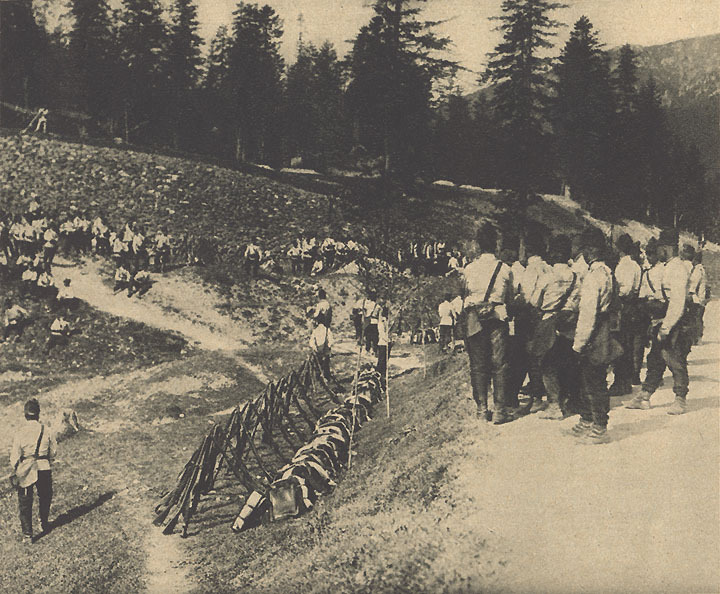 The corps commanded by Benigni attacked the Romanian 6th and 7th Infantry divisions, at ten o’clock, in the morning of August 8, in an area with rugged terrain dominated by forests. Romanian soldiers gradually withdrew. Very intense fights also occurred in the area of the Cașin Hillock, but the Romanian forces reacted promptly and repulsed the attack. On August 9, Benigni ordered an attack on the Coşna Hill (788 meters). The Romanians anticipated the strike and attacked first at nine o’clock in the morning, pushing the 7lst back, almost to the initial positions it held the day before. The Germans and Austro-Hungarians immediately sent their reserves to the front line and counterattacked. Although they had not attained their goals, the German and Austro-Hungarian troops were nonetheless in a good position to continue the offensive. On August 10, General Gerok ordered another attack and Benignis’s soldiers were able to push back the Romanian defenders and to clear the road to Grozești. Intense fighting on the Cașin Hillock pushed the Romanians off Coşna Hill and German units managed to get close to Grozești. Slănic was ocupied, and so was Pravila Peak (875 meters), but Romanian resistance was stiff on Cireşoaia Peak. The Russians immediately withdrew from Cleja Peak when they came in contact with the 225th Infantry Division. For August 11, the orders received by the troops of the Central Powers were to completely conquer the heights to the northwest of the Caşin Monastery and the Coşna Peak. Meanwhile, the 117th Infantry Division attacked Coşna Peak, having as its vanguard the soldiers of the Wurttemberg Mountain Battalion. German troops eventually occupied the Grozeşti Hill, and other strategic heights in the area, including Cireşoaia Peak. German machine guns forced the Romanian 7th Infantry Division to withdraw from the road to Trotuș. Ocna was already in the sight of the attackers, their morale being very good. Faced with this danger, the Romanians moved their heavy artillery to Onești and other artillery pieces behind it. The Romanian reserves, thrown into battle in the breaches of the Romanian 6th and 7th Infantry divisions made a vital contribution to stopping the enemy offensive and even liberating some villages in the area. Despite all the losses and despite the territory it had lost, Romanian command saw that the enemy attacks were losing their intensity and believed that it was possible, with a decisive counter-offensive to push the enemy back. On August 12, in response to the arrival of enemy troops on the Trotuş, a powerful attack of the Romanian 7th infantry Division and of the Russian 2nd Infantry Division, in the afternoon, crushed a Honvéd brigade, in the area of the Cireşoaia Peak, the few survivors running into to the forest. Other troops were forced to retreat, and the 117th Infantry Division fought a terrible defensive fight at Coşna Peak. On August 13, the Romanians counterattacked. Success was almost complete, only a few units of the enemy successfully resisting on the entire line. The objective was reached, the enemy was trapped in the pass, its losses were significant, and the Romanians were victorious again. Even though it was the smallest of the three battles fought in the summer of 1917, the Battle of Oituz had the great merit of succeeding in defending their fellow Romanian troops from a strong attack on the flanks, an attack that would have destabilized and even compromised the front. For the German and Austro-Hungarian command, the Battle of Oituz was a great disappointment. Although the Central Powers troops succeeded in advancing between two and six kilometres on a 18-20 km wide front, they failed to break through the Romanian lines and in crossing the Trotuș, which would have enabled them to encircle the Russian-Romanian armies west of the Siret River.